her book, Patrick the Proud Parrot. She also illustrated the book and drew the many activities. 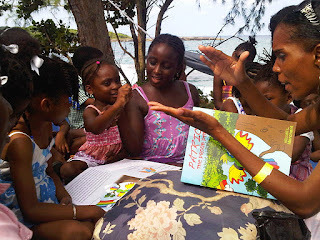 The second staging of the International VoYces Literary Fair was held on the evening of November 5 and on November 6 at the Strawberry Fields Together beachfront property in the district of Robin's Bay, St Mary, Jamaica. The two-day event was organised by writer Judith Falloon Reid and her husband Michael Brown. The children's programe, called the IVLF Pickney Korna, was held on November 6 under casuarinas trees. The programme was co-ordinated by UWI graduate student, Peta-Ann Long, and assisted by Shauna Malcolm and Safi Harriott. 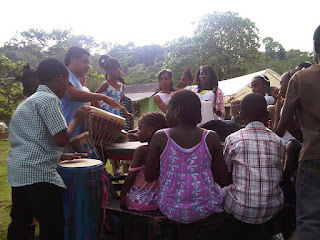 The activities featured story reading, drawing, and a drumming lesson by Human Resources Practitioner, Hugh Shim, of Drums for Peace. Kellee L Merchant read from her children's activity book Patrick the Proud Parrot (LMH 2010). Merchant's book is a thriller that encourages children to be obedient to parents and to also treat friends and others with respect. It has 17 activities including word games and pencil and paper activities. Toddlers can appreciate hearing the story and primary school age children can find activities at their level. There was one youth reader on the ILVF programme, Joel McGowan, who read from his book of poems, Journey by 9. In addition to the structured events, some children enjoyed a dip in the sea under the supervision of their parents. Among the booths at the festival were Jamcopy, the Jamaica Business Journal, St Mary's University of Minnesota, Calabash Creations by Albert Jonas of Irish Town, Beyond Jewellery, Bookophilia bookstore, natural fruits and juices, and a stall with Rasta themed apparel, arts and crafts.